Isn’t it funny how something that looks so gross can make something so deliciously good? 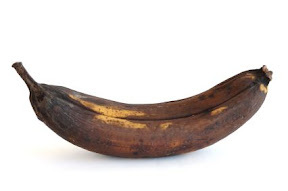 I had to keep telling Keenan NOT to throw away the dark, rotten bananas in the fruit bowl — no matter how gross they looked. I assured him I had better plans for them than the trash bin. My plan, of course, was to make banana bread. I turned to my “Cookin’ with the Clan” cookbook my mom gave me when I moved into my own apartment in 2005 (wow, has it really been five years??). The inside cover reads “August 2005. Good luck cooking! Love you, Mom.” When I first started cooking I called my mom a lot and to be honest…I still do (and for more than just cooking tips). Let it be warned that you may find yourself buying a bundle of bananas only to let a few “accidentally” go bad!